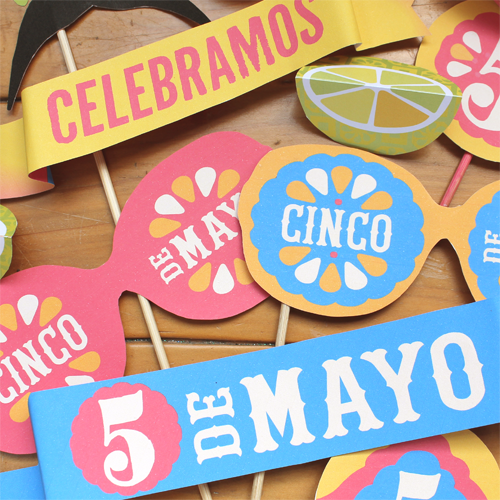 Printables for your Cinco de Mayo fiesta! What is Cinco de Mayo? Que es Cinco de Mayo? So what is Cinco de Mayo? This holiday is celebrated in Puebla in Mexico and in many US cities with large Mexican populations. The festival began as a regional celebration of the defeat of the French Army by Mexican soldiers at the battle of Puebla. It is still a big celebration in Puebla and in Mexico city, with parades, fiestas and fireworks (and a visit from Marc Anthony last year! ), but for the rest of Mexico it seems the anniversary is not such a big deal. Cinco de Mayo is, however, a major celebration in the United States. Some believe this is because the battle marked a change in the relationship between the United States and Mexico. The theory is that from Mexico, Napoleon III wanted to aid the Confederacy in the U.S. Civil War, which would have meant a longer, bloodier war. At that time, the French Army was the greatest military force on the globe so the victory was a huge achievement for the Mexican Army. So how to celebrate Cinco de Mayo? Whether or not you are of Mexican heritage, Cinco de Mayo is a chance to celebrate all things Mexican! From wonderful food to colorful traditions, crafts and music, it’s time to party! Mole Poblano is traditionally served on Cinco de Mayo and legend has it that the dish originates from Puebla. The story goes that two nuns were surprised by a visitor. Not being cooks they took a mortar and pestle and ground together all the ingredients that they could find – tomatoes, chocolate and chillies and then simmered the mix until it thickened into a sauce, now known as Mole. There is a rich Mexican tradition of paper crafting. Pinatas, papel picado and paper flowers are important in the festivities of Cinco de Mayo as well as Dia de los Muertos. We’ve put together video tutorials showing you how to make your own mexican paper flowers and papel picado crepe paper garlands. They are surprisingly fun and easy to make. This year we also had fun making mini pinatas and lucha libre paper masks – you can find the free printable templates and tutorials here on the Happythought site. The battle of Cinco de Mayo has been re-enacted since the 1930s in Puebla and Peñón de los Baños, Mexico City. Men dress as Mexican and French soldiers and generals, women dress as soldaderas, who as well cooking and looking after the soldiers, fought alongside them. Why not stage your own re-enactment? If you have and feedback or comments we would love to hear from you. Also included in our Cinco de Mayo offerings , paper flower crown tutorial + template, ‘Free printable Luche Libre masks‘, some ‘Cinco de Mayo Coloring in pages‘ and a great ‘How to make a pinata tutorial‘ plus the template. We hope you enjoy this post on Cinco de Mayo! If so, please give us a little love on by liking us on facebook, pinning us on pinterest or following us on twitter. I just wanted to clear up some muddled items that were posted. If Napoleon Bonaparate was born in 1769 and died in 1821, how could he help the Confederates with the US Civil War? Napoleon Bonaparte sold the Louisiana Purchase to Jefferson in 1803 to fund his wars. I believe you meant to cite Napoleon III, who had France suffer from Great Britain’s naval blockade, which caused the French economic strife. Being cornered, Napoleon III started the Franco-Mexican War (1861-1867) in an attempt to make Mexico a French colony. Mexico’s President Juarez had declared bankruptcy because the country was still recovering from its revolution.Although Great Britain and Spain made arrangements to be paid later, Napoleon III decided to take advantage of this situation. Yes, this humble Mexican army being outnumbered 2:1, defeated the French in Puebla and won the Franco-Mexican War. American soldiers learning that the young Mexican cadets at mountain top of the Chapultepec Military School preferred to wrap themselves up in the Mexican flag and jump to their perilous death, rather than being captured by the French, were inspired. This is why there is a red binding in the US Marine uniform; the ultimate sacrifice.They were known as the “boy heroes”. Also, mole is an ancient Mexican sauce that was created by the indigenous people of Mexico, long before those kitchen-challenged nuns arrived.Every region and family in Mexico makes mole in their own traditional way. It was not a whipped up, willy-nilly miracle. hello, The Day of the Death is coming, and here in Puerto Vallarta, Jal, Mexico the people has forget about our tradition, but around the web I realize that the american and website have so much information about November 2nd. I like to congrats to both of you, because do the masks and the “Altar” also is the first time that I read something true about 5 de Mayo. It’s not our National Party that is September 15. Just Puebla celebrate it. I’m happy because mexican traditions are great and need to be know by other people and need that the mexican turn back and realize it and maybe celebrate Halloween but don’t forget that is our culture.